According to a Pew Research Study, more than one in three millennials have at least one tattoo. Tattoos have become a growing trend for people to decorate their bodies and express themselves, especially among young adults. While some people do not think tattoos are tasteful or might be too afraid of the pain to get one, there are still many students at California Baptist University who proudly display their tattoos. Yeaney got his first tattoo when he was 18 years old and now has six. He plans to eventually be covered in tattoos. His two most prominent tattoos are displayed on his forearms and feature an American traditional- style snake and rose on one arm and an arrow on the other. 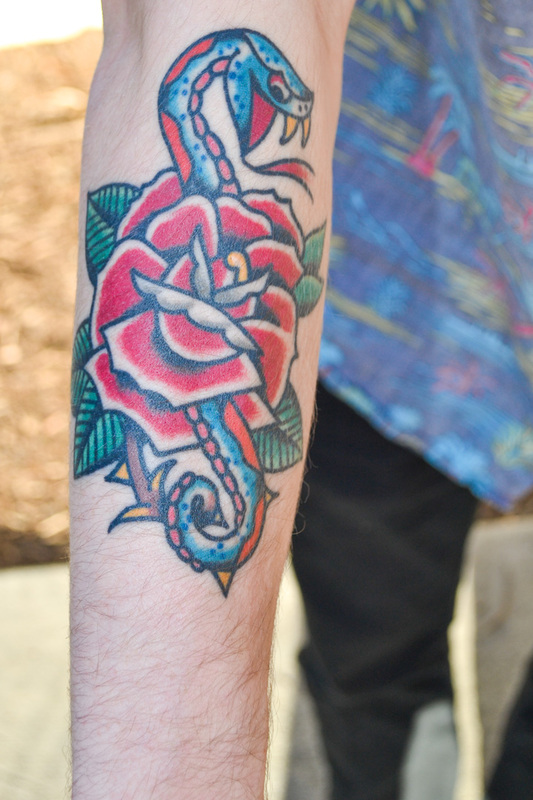 A rose is a classic staple of this popular tattoo style. Yeaney explained the arrow was a symbol for his philosophy in life – to keep moving forward. “An arrow moves in one solid direction and never backward. In life, that means taking one step at a time,” Yearney said. He first got an arrow tattooed on his upper thigh and then chose to get another, larger arrow in an area more people could see. Brook Suneson, sophomore sociology major, has three significant tattoos on her thigh, forearm and ankle. Suneson’s first tattoo was an anchor tattooed on her arm. “The anchor is representative of my favorite verse, Hebrews 6:19. I really love what anchors symbolize. They don’t sway like the hope we have for God,” said Suneson. Two blue hearts on the anchor represent two of Suneson’s brothers, Jonathan and Tyler, who died. “I wouldn’t get a tattoo just because it looks good. All of mine have meaning and significance,” Suneson said. Her second tattoo is a red rose on her ankle. Suneson’s mother had a rose tattooed on her ankle before Suneson was born. Suneson said she chose to get a rose tattooed on the same spot to honor her mother and her great-grandmother, whose favorite flower was a rose. Her largest and most recent tattoo is a watercolor, Disney-inspired tattoo on her thigh. The focus point of the tattoo is large Sorcerer Mickey–Suneson’s favorite version of Mickey Mouse. Suneson’s love for Disney has been ingrained in her since playing in her grandmother’s “Disney room” as a kid. “Disney is about believing in stories and magic and not getting rid of the kid in you,” said Suneson, a lifelong Disney fan who estimates she will visit Disneyland more than a thousand times in her life. “It’s hard for adults to remember being a kid, but Disney shows people it’s OK to be a kid. “My grandma is just as obsessed with Disney as I am. She hates tattoos but when she saw mine, she said it wasn’t terrible,” Suneson said. Despite what some may view as a “permanent mistake,” tattoos are artistic, significant and personal ways to remember a loved one, remind oneself of something meaningful or simply decorate one’s body.